"1 WTC" and "Freedom Tower" redirect here. For other uses, see 1 WTC (disambiguation) and Freedom Tower (disambiguation). For the World Trade Center building in Long Beach, California, see One World Trade Center (Long Beach). One World Trade Center (also known as One WTC, 1 World Trade Center, 1 WTC, or Freedom Tower[note 1]) is the main building of the rebuilt World Trade Center complex in Lower Manhattan, New York City. One WTC is the tallest building in the United States, the tallest building in the Western Hemisphere, and the sixth-tallest in the world. The supertall structure has the same name as the North Tower of the original World Trade Center, which was destroyed in the terrorist attacks of September 11, 2001. The new skyscraper stands on the northwest corner of the 16-acre (6.5 ha) World Trade Center site, on the site of the original 6 World Trade Center. The building is bounded by West Street to the west, Vesey Street to the north, Fulton Street to the south, and Washington Street to the east. b. Skidmore, Owings & Merrill. The building's architect is David Childs, whose firm Skidmore, Owings & Merrill (SOM) also designed the Burj Khalifa and the Willis Tower. The construction of below-ground utility relocations, footings, and foundations for the new building began on April 27, 2006. One World Trade Center became the tallest structure in New York City on April 30, 2012, when it surpassed the height of the Empire State Building. The tower's steel structure was topped out on August 30, 2012. On May 10, 2013, the final component of the skyscraper's spire was installed, making the building, including its spire, reach a total height of 1,776 feet (541 m). Its height in feet is a deliberate reference to the year when the United States Declaration of Independence was signed. The building opened on November 3, 2014; the One World Observatory opened on May 29, 2015. On March 26, 2009, the Port Authority of New York and New Jersey (PANYNJ) confirmed that the building would be officially known by its legal name of "One World Trade Center", rather than its colloquial name of "Freedom Tower". The building is 104 standard floors high, but the tower has only 94 actual stories. The new World Trade Center complex will eventually include five high-rise office buildings built along Greenwich Street, as well as the National September 11 Memorial & Museum, located just south of One World Trade Center where the original Twin Towers stood. The construction of the new building is part of an effort to memorialize and rebuild following the destruction of the original World Trade Center complex. For comprehensive information on the original World Trade Center, see World Trade Center (1973–2001). The construction of the World Trade Center, of which the Twin Towers (One and Two World Trade Center) were the centerpieces, was conceived as an urban renewal project and spearheaded by David Rockefeller. The project was intended to help revitalize Lower Manhattan. The project was planned by the Port Authority of New York and New Jersey, which hired architect Minoru Yamasaki. Yamasaki came up with the idea of building twin towers. After extensive negotiations, the New Jersey and New York State governments, which supervise the Port Authority, consented to the construction of the World Trade Center at the Radio Row site, located in the lower-west area of Manhattan. To satisfy the New Jersey government, the Port Authority agreed to buy the bankrupt Hudson & Manhattan Railroad (renamed to Port Authority Trans-Hudson), which transported commuters from New Jersey to Lower Manhattan. The towers were designed as framed tube structures, giving tenants open floor plans, unobstructed by columns or walls. This design was accomplished by using many closely spaced perimeter columns, providing much of the structure's strength, with the gravity load shared with the core columns. The elevator system, which made use of sky lobbies and a system of express and local elevators, allowed substantial floor space to be used for office purposes by making the structural core smaller. The design and construction of the towers involved many other innovative techniques, such as wind tunnel experiments and the slurry wall for digging the foundation. Construction of the North Tower (One World Trade Center) began in August 1966; extensive use of prefabricated components sped up the construction process. The first tenants moved into the North Tower in December 1970. In the 1970s, four other low-level buildings were built as part of the World Trade Center complex. A seventh building was built in the mid-1980s. After Seven World Trade Center was built in the 1980s, the World Trade Center complex had a total of seven buildings; however, the most notable ones were the main Twin Towers built in the 1970s—One World Trade Center was the North Tower, and Two World Trade Center was the South Tower. Each tower was over 1,350 feet (410 m) high, and occupied about 1 acre (0.40 ha) of the total 16 acres (6.5 ha) of the site's land. During a press conference in 1973, Yamasaki was asked, "Why two 110-story buildings? Why not one 220-story building?" His response was, "I didn't want to lose the human scale." When it was topped out on December 4, 1970, One World Trade Center became the tallest building in the world, surpassing the Empire State Building, which had held the record for 40 years. The North Tower was 1,368 feet (417 m) tall, and in 1978, a telecommunications antenna was added to the top of the roof; by itself, the antenna was 360 feet (110 m) tall. With the 360-foot (110 m)-tall antenna, the highest point of the North Tower reached 1,728 ft (527 m). However, the tower only held its record until May 1973, when Chicago's Sears Tower (now Willis Tower), which was 1,450 feet (440 m) tall at the rooftop, was completed. At 110 floors, the World Trade Center towers had more floors than any other building at that time. This number was not surpassed until the construction of the Burj Khalifa (163 floors), which opened in 2010. Of the 110 stories, eight were set aside as mechanical floors (floors 7/8, 41/42, 75/76, and 108/109), which were four two-floor areas that were spaced up the building in even intervals. All the remaining floors were open for tenants. Each floor of the tower had 40,000 square feet (3,700 m2) of available space. The North and South tower had 3,800,000 square feet (350,000 m2) of total office space. The entire complex of seven buildings had a combined total of 13,400,000 square feet (1,240,000 m2) of office space. The complex initially failed to attract the expected clientele. During the early years, various governmental organizations became key tenants of the World Trade Center, such as the State of New York. In the 1980s, the city's perilous financial condition eased, after which an increasing number of private companies—mostly financial firms related to Wall Street—became tenants. During the 1990s, approximately 500 companies had offices in the complex, including financial companies such as Morgan Stanley, Aon Corporation, and Salomon Brothers. The basement concourse of the World Trade Center included The Mall at the World Trade Center, and a PATH station. The North Tower became the main corporate headquarters of Cantor Fitzgerald, and it also became the headquarters of the Port Authority of New York and New Jersey. The tower's electrical service was supplied by Consolidated Edison (ConEd) at 13,800 volts. The electricity passed through the World Trade Center Primary Distribution Center (PDC), and was then sent up the building's core to electrical substations located on the mechanical floors. The substations lowered the 13,800 primary voltage to 480/277 volts, and the voltage was then further lowered to 208/120 volts for general power and lighting services. The complex was also served by emergency generators located in the sub-levels of the towers and on the roof of Five World Trade Center. The 110th floor of One World Trade Center (the North Tower) housed radio and television transmission equipment. The roof of the North Tower contained a vast array of transmission antennas, including the 360 feet (110 m) center antenna mast, rebuilt by Dielectric Inc. to support DTV in 1999. The center mast contained the television signals for almost all NYC television broadcasters: WCBS-TV 2, WNBC-TV 4, WNYW 5, WABC-TV 7, WWOR-TV 9 Secaucus, WPIX 11, WNET 13 Newark, WPXN-TV 31 and WNJU 47 Linden. It also had four NYC FM broadcasters: WPAT-FM 93.1, WNYC 93.9, WKCR 89.9, and WKTU 103.5. Access to the roof was controlled by the WTC Operations Control Center (OCC), located in the B1 level of the South Tower. After the September 11 attacks of 2001, the broadcasting equipment for the radio and television stations was moved to the Empire State Building. On a typical weekday, a combined total of 50,000 people worked in the North and South Towers, with another 200,000 passing through as visitors. The complex was so large that it had its own zip code: 10048. The Windows on the World restaurant, located on top of the North Tower, reported revenues of $37 million in 2000, making it the highest-grossing restaurant in the United States. 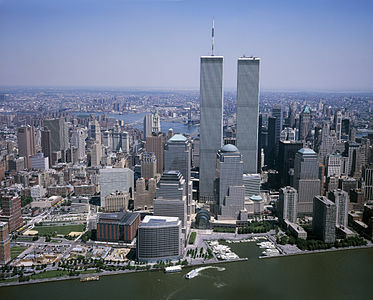 The Twin Towers became known worldwide, appearing in movies, television shows, postcards, and other merchandise. The towers came to be seen as a New York City icon, much like the Empire State Building, the Chrysler Building, and the Statue of Liberty. On February 13, 1975, a three-alarm fire broke out on the 11th floor of the North Tower. The fire spread through the core of the building to the 9th and 14th floors, as the insulation for telephone cables, located in a utility shaft that ran vertically between floors, had been ignited. Areas most affected by the fire were extinguished almost immediately, and the original fire was put out in a few hours. Most of the damage was on the 11th floor, where the fire was fueled by cabinets filled with paper, alcohol-based fluid for office machines, and other office equipment. Fireproofing protected the steel, and there was no structural damage to the tower. In addition to the fire damage on the 9th and 14th floors, water used to extinguish the fire damaged a few floors below. At the time, the World Trade Center complex had no fire sprinkler systems. The first terrorist attack on the World Trade Center occurred on February 26, 1993, at 12:17 p.m., when a Ryder truck filled with 1,500 pounds (680 kg) of explosives, planted by Ramzi Yousef, detonated in the underground garage of the North Tower. The blast resulted in a 100 feet (30 m) hole through five sublevels. The greatest damage was on levels B1 and B2, with significant structural damage on level B3. Six people were killed, and more than a thousand were injured, as 50,000 workers and visitors were inside the tower at the time. Many people inside the North Tower were forced to walk down darkened stairwells that had no emergency lighting, and some took two hours or more to reach safety. At 8:46 a.m. (EDT) on September 11, 2001, five hijackers affiliated with al-Qaeda crashed American Airlines Flight 11 into the northern facade of the North Tower between the 93rd and 99th floors. Seventeen minutes later, at 9:03 a.m. (EDT), a second group of terrorists crashed the hijacked United Airlines Flight 175 into the southern facade of the South Tower, striking between the 77th and 85th floors. By 9:59 a.m. (EDT), the South Tower collapsed after burning for approximately 56 minutes. After burning for 102 minutes, the North Tower collapsed due to structural failure at 10:28 a.m. (EDT). When the North Tower collapsed, debris fell on the nearby 7 World Trade Center, damaging it and starting fires. The fires burned for hours, compromising the building's structural integrity. Seven World Trade Center collapsed at 5:21 p.m. (EDT). Together with a simultaneous attack on the Pentagon in Arlington, Virginia, and a failed plane hijacking that resulted in a plane crash in Shanksville, Pennsylvania, the attacks resulted in the deaths of 2,996 people (2,507 civilians, 343 firefighters, 72 law enforcement officers, 55 military personnel, and the 19 hijackers). More than 90% of the workers and visitors who died in the towers had been at or above the points of impact. In the North Tower, 1,355 people at or above the point of impact were trapped, and died of smoke inhalation, fell, jumped from the tower to escape the smoke and flames, or were killed when the building eventually collapsed. One stairwell in the South Tower, Stairwell A, somehow avoided complete destruction, unlike the rest of the building. When Flight 11 hit, all three staircases in the North Tower above the impact zone were destroyed, thus making it impossible for anyone above the impact zone to escape. 107 people below the point of impact also died. Following the destruction of the original World Trade Center, there was debate regarding the future of the World Trade Center site. 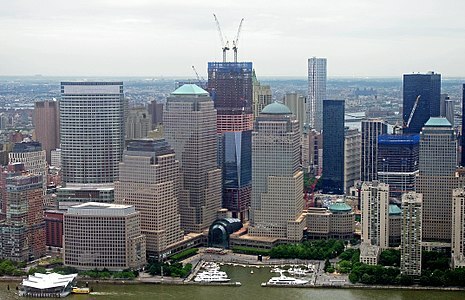 There were proposals for its reconstruction almost immediately, and by 2002, the Lower Manhattan Development Corporation had organized a competition to determine how to use the site. The proposals were part of a larger plan to memorialize the September 11 attacks and rebuild the complex. When the public rejected the first round of designs, a second, more open competition took place in December 2002, in which a design by Daniel Libeskind was selected as the winner. This design underwent many revisions, mainly because of disagreements with developer Larry Silverstein, who held the lease to the World Trade Center site at that time. There was criticism concerning the limited number of floors that were designated for office space and other amenities in an early plan. Only 82 floors would have been habitable, and the total office space of the rebuilt World Trade Center complex would have been reduced by more than 3,000,000 square feet (280,000 m2) in comparison with the original complex. The floor limit was imposed by Silverstein, who expressed concern that higher floors would be a liability in the event of a future terrorist attack or other incident. Much of the building's height would have consisted of a large, open-air steel lattice structure on the roof of the tower, containing wind turbines and "sky gardens". 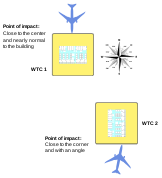 In a subsequent design, the highest occupiable floor became comparable to the original World Trade Center, and the open-air lattice was removed from the plans. In 2002, former New York Governor George Pataki faced accusations of cronyism for supposedly using his influence to get the winning architect's design picked as a personal favor for his friend and campaign contributor, Ronald Lauder. A final design for the "Freedom Tower" was formally unveiled on June 28, 2005. To address security issues raised by the New York City Police Department, a 187-foot (57 m) concrete base was added to the design in April of that year. The design originally included plans to clad the base in glass prisms in order to address criticism that the building might have looked uninviting and resembled a "concrete bunker". However, the prisms were later found to be unworkable, as preliminary testing revealed that the prismatic glass easily shattered into large and dangerous shards. As a result, it was replaced by a simpler facade consisting of stainless steel panels and blast-resistant glass. Contrasting with Libeskind's original plan, the tower's final design tapers octagonally as it rises. Its designers stated that the tower would be a "monolithic glass structure reflecting the sky and topped by a sculpted antenna." In 2006, Larry Silverstein commented on a planned completion date: "By 2012 we should have a completely rebuilt World Trade Center, more magnificent, more spectacular than it ever was." 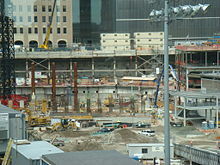 On April 26, 2006, the Port Authority of New York and New Jersey approved a conceptual framework that allowed foundation construction to begin. A formal agreement was drafted the following day, the 75th anniversary of the 1931 opening of the Empire State Building. Construction began in May; a formal groundbreaking ceremony took place when the first construction team arrived. The symbolic cornerstone of One World Trade Center was laid in a ceremony on July 4, 2004. The stone had an inscription supposedly written by Arthur J. Finkelstein. However, construction was delayed until 2006 due to disputes over money, security, and design. The last major issues were resolved on April 26, 2006, when a deal was made between developer Larry Silverstein and the Port Authority of New York and New Jersey, so the cornerstone was temporarily removed from the site on June 23, 2006. Soon after, explosives were detonated at the construction site for two months to clear bedrock for the building's foundation, onto which 400 cubic yards (310 cubic meters) of concrete was poured by November 2007. In a December 18, 2006, ceremony held in nearby Battery Park City, members of the public were invited to sign the first 30-foot (9.1 m) steel beam installed onto the building's base. It was welded onto the building's base on December 19, 2006. Foundation and steel installation began shortly afterward, so the tower's footings and foundation were nearly complete within a year. In January 2008, two cranes were moved onto the site. Construction of the tower's concrete core, which began after the cranes arrived, reached street level by May 17. However, construction of the base was not finished until two years later, after which construction of the office floors began, and the first glass windows were subsequently installed; during 2010, floors were constructed at a rate of about one per week. An advanced "cocoon" scaffolding system was installed to protect workers from falling, and was the first such safety system installed on a steel structure in the city. The tower reached 52 floors and was over 600 feet (180 m) tall by December 2010. The tower's steel frame was halfway complete by then, but grew to 82 floors by the tenth anniversary of the September 11 attacks, at which time its concrete flooring had reached 72 floors and the glass cladding had reached 56 floors. In 2009, the Port Authority changed the official name of the building from "Freedom Tower" to "One World Trade Center", stating that this name was the "easiest for people to identify with." The change came after board members of the Port Authority voted to sign a 21-year lease deal with Vantone Industrial Co., a Chinese real estate company, which would become the building's first commercial tenant to sign a lease. Vantone plans to create the China Center, a trade and cultural facility, covering 191,000 square feet on floors 64 through 69. Detailed floor plans of the tower were posted on New York City's Department of Finance website in May 2011. This resulted in an uproar from the media and citizens of the surrounding area, who warned that the plans could potentially be used for a future terrorist attack. While under construction, the tower was specially illuminated on several occasions. On the weekend of July 4, 2011, it was lit up with the colors of the U.S. flag to commemorate Independence Day, and it was lit up with the same colors on September 11 to mark the 10th anniversary of the September 11 terrorist attacks. On October 27 of that same year, it was illuminated with pink in honor of Breast Cancer Awareness Month. On December 11, the Port Authority illuminated the tower with multicolored lights to celebrate the holiday season. On February 24, 2012, the building was lit up with red in honor of Archbishop of New York Timothy Dolan, who became a cardinal on February 18. On June 14, 2012, it was illuminated with red, white, and blue to honor Flag Day. In August, it was illuminated with red in honor of the Armed Forces. On September 8, 2012, it was once again illuminated with red, white, and blue to honor the 11th anniversary of the September 11 attacks. On June 24, 2013, the building was again illuminated with red, white, and blue to celebrate the Fourth of July. On November 12, 2013, three hundred red, white, and blue lights were lit up. The tower's loading dock, however, was not due to be finished in time to move equipment into the completed building, so five temporary loading bays were added at a cost of millions of dollars. The temporary PATH station was not to be removed until its official replacement, the World Trade Center Transportation Hub, was completed, blocking access to the planned loading area. By March 2012, One World Trade Center's steel structure had reached 93 floors, growing to 94 floors and 1,240 feet (380 m) by the end of the month. However, because the floor numberings were based on standard measurements, the 94th floor was numbered "floor 100", because the extra space was occupied by the high-ceilinged 91st floor, which was used for mechanical purposes. The still-incomplete tower became New York City's tallest building by roof height in April 2012, passing the 1,250-foot (380 m) roof height of the Empire State Building. President Barack Obama visited the construction site two months later and wrote, on a steel beam that would be hoisted to the top of the tower, the sentence "We remember, we rebuild, we come back stronger!" That same month, with the tower's structure nearing completion, the owners of the building began a public marketing campaign for the building, seeking to attract visitors and tenants. One World Trade Center's steel structure topped out at the nominal 104th floor, with a total height of 1,368 feet (417 m), in August 2012. The tower's spire was then shipped from Quebec to New York in November 2012, and the first section of the spire was hoisted to the top of the tower on December 12, 2012, and was installed on January 15, 2013. By March 2013, two sections of the spire had been installed. The spire's completion was scheduled for April 29, 2013, but bad weather delayed the delivery of the final pieces. On May 10, 2013, the final piece of the spire was lifted to the top of One World Trade Center, bringing the tower to its full height of 1,776 feet (541 m), and making it the fourth-tallest building in the world at the time. In subsequent months, the exterior elevator shaft was removed; the podium glass, interior decorations, and other finishings were being installed; and installation of concrete flooring and steel fittings was completed. A report in September 2013 revealed that, at the time of the report, the World Trade Center Association (WTCA) was negotiating with regard to the "World Trade Center" name, as the WTCA had purchased the rights to the name in 1986. The WTCA sought $500,000 worth of free office space in the tower in exchange for the use of "World Trade Center" in the tower's name and associated souvenirs. 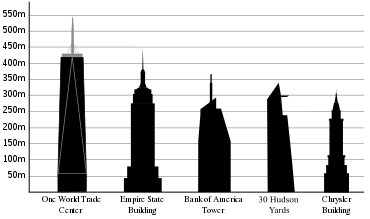 On November 12, 2013, the Height Committee of the Chicago-based Council on Tall Buildings and Urban Habitat (CTBUH) made the controversial announcement that One World Trade Center was the tallest building in the United States at 1,776 feet (541 m), declaring that the mast on top of the building is a spire since it is a permanent part of the building's architecture. By the same reasoning, the building was also the tallest in the Western Hemisphere. One World Trade Center under construction behind the World Financial Center in June 2011. One World Trade Center (to the left) and 4 World Trade Center under construction, as seen from a helicopter on April 30, 2012. On November 1, 2014, moving trucks started moving items for the tower's first occupying tenant, magazine publisher Condé Nast, from its old headquarters in Times Square to One World Trade Center. The New York Times noted that the area around the World Trade Center had transitioned from a financial area to one with technology firms, residences, and luxury shops, coincident with the building of the new tower. The building opened on November 3, 2014, and Condé Nast employees moved into spaces spread among 24 floors. Condé Nast occupied floors 20 to 44, having completed its move in early 2015. It was expected that the company would attract new tenants to occupy the remaining 40% of unleased space in the tower, as Condé Nast had revitalized Times Square after moving there in 1999. Only about 170 of 3,400 total employees moved into the new tower on the first day. At the time, future tenants included Kids Creative, Legends Hospitality, the BMB Group, Servcorp, and GQ. On November 12, 2014, the supporting wire rope cables of a suspended working platform slacked. The cables were manufactured by Tractel, and they were used to hold workers who performed maintenance on the building's exterior. At the time, the platform was holding a two-man, SEIU-affiliated window washing team. The slack caused the platform to hang almost vertically near the 68th floor of the tower. The workers were rescued by over 100 FDNY firefighters, who used a diamond saw to cut through the glass. After the incident, the workers suffered from a slight case of hypothermia, and were taken to the hospital. An estimate in February 2007 placed the initial construction cost of One World Trade Center at about $3 billion, or $1,150 per square foot ($12,380 per square meter). However, the tower's total estimated construction cost had risen to $3.9 billion by April 2012, making it the most expensive building in the world at the time. The tower's construction was partly funded by approximately $1 billion of insurance money that Silverstein received for his losses in the September 11 attacks. The State of New York provided an additional $250 million, and the Port Authority agreed to give $1 billion, which would be obtained through the sale of bonds. The Port Authority raised prices for bridge and tunnel tolls to raise funds, with a 56 percent toll increase scheduled between 2011 and 2015; however, the proceeds of these increases were not used to pay for the tower's construction. Preliminary site plans for the World Trade Center's reconstruction. In orange are the new buildings (One World Trade Center is the square at upper left), and in blue is the 9/11 Memorial and Museum. Many of Daniel Libeskind's original concepts from the 2002 competition were discarded from the tower's final design. One World Trade Center's final design consisted of simple symmetries and a more traditional profile, intended to compare with selected elements of the contemporary New York skyline. The tower's central spire draws from previous buildings, such as the Empire State Building and the Chrysler Building. It also visually resembles the original Twin Towers, rather than being an off-center spire similar to the Statue of Liberty. One World Trade Center is considered the first major building whose construction is based upon a three-dimensional Building Information Model. The building occupies a 200-foot (61 m) square, with an area of 40,000 square feet (3,700 m2), nearly identical to the footprints of the original Twin Towers. The tower is built upon a 185-foot (56 m) tall windowless concrete base, designed to protect it from truck bombs and other ground-level attacks. Originally, the base was to be covered in decorative prismatic glass, but a simpler glass-and-steel façade was adopted when the prisms proved unworkable. The current base cladding consists of angled glass fins protruding from stainless steel panels, similar to those on 7 World Trade Center. LED lights behind the panels illuminate the base at night. Cable-net glass façades on all four sides of the building for the higher floors, designed by Schlaich Bergermann, will be consistent with the other buildings in the complex. The façades are 60 feet (18 m) high, and range in width from 30 feet (9.1 m) on the east and west sides, 50 feet (15 m) on the north side, and 70 feet (21 m) on the south side. The curtain wall was manufactured and assembled by Benson Industries in Portland, Oregon, using glass made in Minnesota by Viracon. From the 20th floor upwards, the square edges of the tower's cubic base are chamfered back, shaping the building into eight tall isosceles triangles, or an elongated square antiprism. Near its middle, the tower forms a perfect octagon, and then culminates in a glass parapet, whose shape is a square oriented 45 degrees from the base. A 408-foot (124 m) sculpted mast containing the broadcasting antenna – designed in a collaboration between Skidmore, Owings and Merrill (SOM), artist Kenneth Snelson (who invented the tensegrity structure), lighting designers, and engineers – is secured by a system of cables, and rises from a circular support ring, which contains additional broadcasting and maintenance equipment. At night, an intense beam of light is projected horizontally from the spire and shines over 1,000 feet (300 m) above the tower. We really wanted our design to be grounded in something that was very real, not just in sculptural sketches. We explored the infrastructural challenges because the proper solution would have to be compelling, not just beautiful. The design does have great sculptural implications, and we fully understand the iconic importance of the tower, but it also has to be a highly efficient building. The discourse about Freedom Tower has often been limited to the symbolic, formal and aesthetic aspects but we recognize that if this building doesn't function well, if people don't want to work and visit there, then we will have failed as architects. Just south of the new One World Trade Center is the National September 11 Memorial & Museum, which is located where the original Twin Towers stood. Immediately to the east is World Trade Center Transportation Hub and the new Two World Trade Center site. To the north is 7 World Trade Center, and to the west is Brookfield Place. One World Trade Center's top floor is officially designated as floor 104, despite the fact that the tower only contains 94 actual stories. The building has 86 usable above-ground floors, of which 78 are intended for office purposes (approximately 2,600,000 square feet (240,000 m2)). The base consists of floors 1–19, including a 65-foot-high (20 m) public lobby, featuring the 90-foot mural ONE: Union of the Senses by American artist José Parlá. The office floors begin at floor 20, and go up to floor 63. There is a sky lobby on floor 64; office floors resume on floor 65, and stop at floor 90. Floors 91–99 and 103–104 are mechanical floors. The tower has a three-story observation deck, located on floors 100–102, in addition to existing broadcast and antenna facilities. Similar to the Empire State Building, visitors to the observation deck and tenants have their own separate entrances; one entrance is on the West Street side of the building, and the other is from within the shopping mall, descending down to a below-ground security screening area. On the observation deck, the actual viewing space is on the 100th floor, but there is a food court on the 101st floor and a space for events for the 102nd floor. To show visitors the city, and give them information and stories about New York, an interactive tool called City Pulse is used by Tour Ambassadors. The admission fee is $32 per person, but admission discounts are available for children and seniors, and the deck is free for 9/11 responders and families of 9/11 victims. When it opened, the deck was expected to have about 3.5 million visitors per year. Tickets went on sale starting on April 8. However, the Manhattan District Attorney probed the Port Authority about the firm to which it awarded a contract to operate the deck. It officially opened on May 28, 2015, one day ahead of schedule. There are three eating venues at the top of the building: a café (called One Café), a bar and "small plates" grill (One Mix), and a fine dining restaurant (One Dining). Some have criticized the food prices; the need of a full observatory ticket purchase to enter; and their reputations compared to Windows on the World, the top-floor restaurant in the original One World Trade Center. The tenants have access to below-ground parking, storage, and shopping; access to PATH, New York City Subway trains, and the World Financial Center is also provided at the World Trade Center Transportation Hub, Fulton Street/Fulton Center, Chambers Street, and Cortlandt Street stations. The building allows direct access to West Street, Vesey Street, and Fulton Street at ground level. The building has an approximate underground footprint of 42,000 square feet (3,900 m2), of which 55,000 square feet (5,100 m2) is retail space. A plan to build a restaurant near the top of the tower, similar to the original One World Trade Center's Windows on the World, was abandoned as logistically impractical. The tower's window-washing tracks are located on a 16-square-foot area, which will be designated as floor 110 as a symbolic reference to the 110 floors of the original tower. The original design went through significant changes after the Durst Organization joined the Port Authority of New York and New Jersey as the co-developer of the project in 2010. The 185-foot (56 m) tall base corners were originally designed to gently slope upward, and have prismatic glass. The corners were later squared. In addition, the base's walls are now covered in "hundreds of pairs of 13-foot vertical glass fins set against horizontal bands of eight-inch-wide stainless-steel slats." The spire was originally to be enclosed with a protective radome, described as a "sculptural sheath of interlocking fiberglass panels". However, the radome-enclosed spire was changed to a plain antenna. Douglas Durst, the chairman of the Durst Organization, stated that the design change would save $20 million. However, the tower's architect, Skidmore Owings & Merrill, strongly criticized the change. David Childs, the lead designer, said, "Eliminating this integral part of the building's design and leaving an exposed antenna and equipment is unfortunate ... We stand ready to work with the Port on an alternate design." After joining the project in 2010, the Durst Organization had suggested eliminating the radome to reduce costs, but the proposal was rejected by the Port Authority's then-executive director, Christopher O. Ward. Ward was replaced by Patrick Foye in September 2011. Foye changed the Port Authority's position, and the radome was removed from the plans. In 2012, Douglas Durst gave a statement regarding the final decision: "(the antenna) is going to be mounted on the building over the summer. There's no way to do anything at this point." The large triangular plaza on the west side of One World Trade Center, facing the Hudson River, was originally planned to have stainless steel steps descending to the street. However, the steps were changed to a terrace in the final design. The terrace can be accessed through a staircase on Vesey Street. The terrace is paved in granite, and has 12 sweetgum trees, in addition to a block-long planter/bench. Durst also removed a skylight from the plaza's plans; the skylight was designed to allow natural light to enter the below-ground observation deck lobby. The plaza is 5 ft 8 in (1.73 m) higher than the adjacent sidewalk. The Port Authority formally approved all these revisions, and the revisions were first reported by the New York Post. Patrick Foye, the executive director of the Port Authority, said that he thought that the changes were "few and minor" in a telephone interview. A contract negotiated between the Port Authority and the Durst Organization states that the Durst Organization will receive a $15 million fee and a percentage of "base building changes that result in net economic benefit to the project." The specifics of the signed contract give Durst 75 percent of the savings, up to $24 million, with further returns going down to 50 percent, 25 percent and 15 percent as the savings increase. When viewed from street level in proximity to the tower, One World Trade Center appears to ascend to a pyramid point. The top floor of One World Trade Center is 1,368 feet (417 m) above ground level, along with a 33 ft 4 in (10.16 m) parapet; this is identical to the roof height of the original One World Trade Center. The tower's spire brings it to a pinnacle height of 1,776 feet (541 m), a figure intended to symbolize the year 1776, when the United States Declaration of Independence was signed. When the spire is included in the building's height, as stated by the Council on Tall Buildings and Urban Habitat (CTBUH), One World Trade Center surpasses the height of Taipei 101 (1,671-foot (509 m)), is the world's tallest all-office building, and the sixth-tallest skyscraper in the world, behind the Burj Khalifa, Abraj Al Bait, Shanghai Tower, Ping An Finance Centre and Lotte World Tower. One World Trade Center is the second-tallest freestanding structure in the Western Hemisphere, as the CN Tower in Toronto exceeds One World Trade Center's pinnacle height by approximately 40 ft (12.2 m). The Chicago Spire, with a planned height of 2,000 feet (610 m), was expected to exceed the height of One World Trade Center, but its construction was canceled due to financial difficulties in 2009. After design changes for One World Trade Center's spire were revealed in May 2012, there were questions as to whether the 408-foot (124 m)-tall structure would still qualify as a spire, and thus be included in the building's height. Since the tower's spire is not enclosed in a radome as originally planned, it could be classified as a simple antenna, which is not included in a building's height, according to the CTBUH. Without the antenna, One World Trade Center would be 1,368 feet (417 m) tall, making it the fourth-tallest building in the United States, behind the Willis Tower and Trump International Hotel & Tower, both located in Chicago, and 432 Park Avenue in New York. The building is currently the tallest in New York City with the antenna; however, without the antenna, it was surpassed in 2015 by 432 Park Avenue, which topped out at 1,396 feet (426 m) high. One World Trade Center's developers have disputed the claim that the spire should be reclassified as an antenna following the redesign, with Port Authority spokesman Steve Coleman reiterating that "One World Trade Center will be the tallest building in the Western Hemisphere." In 2012, the CTBUH announced that it would wait to make its final decision as to whether or not the redesigned spire would count towards the building's height. On November 12, 2013, the CTBUH announced that One World Trade Center's spire would count as part of the building's recognized height, giving it a final height of 1,776 feet, and making it the tallest building in the Western Hemisphere. Like other buildings in the new World Trade Center complex, One World Trade Center includes sustainable architecture features. Much of the building's structure and interior is built from recycled materials, including gypsum boards and ceiling tiles; around 80 percent of the tower's waste products are recycled. Although the roof area of any tower is limited, the building implements a rainwater collection and recycling scheme for its cooling systems. The building's PureCell phosphoric acid fuel cells generate 4.8 megawatts (MW) of power, and its waste steam generates electricity. The New York Power Authority selected UTC Power to provide the tower's fuel cell system, which was one of the largest fuel cell installations in the world once completed. The tower also makes use of off-site hydroelectric and wind power. The windows are made of an ultra-clear glass, which allows maximum sunlight to pass through; the interior lighting is equipped with dimmers that automatically dim the lights on sunny days, reducing energy costs. Like all of the new facilities at the World Trade Center site, One World Trade Center is heated by steam, with limited oil or natural gas utilities on-site. One World Trade Center is expected to receive a Leadership in Energy and Environmental Design (LEED) Gold Certification, making it one of the most environmentally sustainable skyscrapers in the world. Along with the protection provided by the reinforced concrete base, a number of other safety features were included in the building's design, so that it would be prepared for a major accident or terrorist attack. Like 7 World Trade Center, the building has 3-foot (91 cm) thick reinforced concrete walls in all stairwells, elevator shafts, risers, and sprinkler systems. There are also extra-wide, pressurized stairwells, along with a dedicated set of stairwells exclusively for the use of firefighters, and biological and chemical filters throughout the ventilation system. 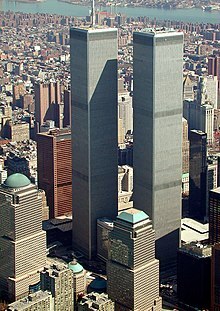 In comparison, the original Twin Towers used a purely steel central core to house utility functions, protected only by lightweight drywall panels. The building is no longer 25 feet (8 m) away from West Street, as the Twin Towers were; at its closest point, West Street is 65 feet (20 m) away. The windows facing West Street are equipped with specially tempered blast-resistant plastic, which looks almost like the glass used in the other sides of the building. The Port Authority has stated: "Its structure is designed around a strong, redundant steel moment frame consisting of beams and columns connected by a combination of welding and bolting. Paired with a concrete-core shear wall, the moment frame lends substantial rigidity and redundancy to the overall building structure while providing column-free interior spans for maximum flexibility." In addition to safety design, new security measures will be implemented. All vehicles will be screened for radioactive materials and other potentially dangerous objects before they enter the site through the underground road. Four hundred closed-circuit surveillance cameras will be placed in and around the site, with live camera feeds being continuously monitored by the NYPD. A computer system will use video-analytic computer software, designed to detect potential threats, such as unattended bags, and retrieve images based on descriptions of terrorists or other criminal suspects. New York City and Port Authority police will patrol the site. Before the World Trade Center site was fully completed, the plaza was not completely opened to the public, as the original World Trade Center plaza was. The initial stage of the opening process began on Thursday, May 15, 2014, when the "Interim Operating Period" of the National September 11 Memorial ended. During this period, all visitors were required to undergo airport style security screening, as part of the "Interim Operating Period", which was expected to end on December 31, 2013. However, screening did not fully end until the official dedication and opening of the museum on May 21, 2014, after which visitors were allowed to use the plaza without needing passes. In March 2014, the tower was scaled by 16-year-old Weehawken, New Jersey resident Justin Casquejo, who entered the site through a hole in a fence. He was subsequently arrested on trespassing charges. He allegedly dressed like a construction worker, sneaked in, and convinced an elevator operator to lift him to the tower's 88th floor, according to news sources. He then used stairways to get to the 104th floor, walked past a sleeping security guard, and climbed up a ladder to get to the antenna, where he took pictures for two hours. The elevator operator was reassigned, and the guard was fired. It was then revealed that officials had failed to install security cameras in the tower, which facilitated Casquejo's entry to the site. Casquejo was sentenced to 23 days of community service as a result. Less than a week after the trespassing incident, four people—three male parachutists (one of whom was a construction worker at the site) and their lookout—were arrested for a BASE jump they conducted on September 30, 2013. They had posted a video of the jump online. As a result of these incidents, the Durst Organization's head of security at One World Trade Center, David Velazquez, resigned on March 28, 2014. The social center of the previous One World Trade Center included a restaurant on the 107th floor, called Windows on the World, and The Greatest Bar on Earth; these were tourist attractions in their own right, and a gathering spot for people who worked in the towers. This restaurant also housed one of the most prestigious wine schools in the United States, called "Windows on the World Wine School", run by wine personality Kevin Zraly. Despite numerous assurances that these attractions would be rebuilt, the Port Authority scrapped plans to rebuild them, which has outraged some observers. The fortified base of the tower has also been a source of controversy. Some critics, including Deroy Murdock of the National Review, have said that it is alienating and dull, and reflects a sense of fear rather than freedom, leading them to dub the building "the Fear Tower". Nicolai Ouroussoff, the architecture critic for The New York Times, calls the tower base a "grotesque attempt to disguise its underlying paranoia". One World Trade Center is principally owned by the Port Authority of New York and New Jersey. Around 5 percent equity of the building was sold to the Durst Organization, a private real estate company, in exchange for an investment of at least $100 million. The Durst Organization assisted in supervising the building's construction, and manages the building for the Port Authority, having responsibility for leasing, property management, and tenant installations. By September 2012, around 55 percent of the building's floor space had been leased, but no new leases were signed for three years until May 2014; the amount of space leased had gone up to 62.8 percent by November 2014. In 2006, the State of New York agreed to a 15-year 415,000 square feet (38,600 m2) lease, with an option to extend the lease's term and occupy up to 1,000,000 square feet (90,000 m2). The General Services Administration (GSA) initially agreed to a lease of around 645,000 square feet (59,900 m2), and New York State's Office of General Services (OGS) planned to occupy around 412,000 square feet (38,300 m2). However, the GSA ceded most of its floor space to the Port Authority in July 2011, and the OGS withdrew from the lease contract. In April 2008, the Port Authority announced that it was seeking a bidder to operate the 18,000 sq ft (1,700 m2) observation deck on the tower's 102nd floor; in 2013, Legends Hospitality Management agreed to operate the observatory in a 15-year, $875 million contract. The building's first lease, a joint project between the Port Authority and Beijing-based Vantone Industrial, was announced on March 28, 2009. A 190,810 sq ft (17,727 m2) "China Center", combining business and cultural facilities, is planned between floors 64 and 69; it is intended to represent Chinese business and cultural links to the United States, and to serve American companies that wish to conduct business in China. Vantone Industrial's lease is for 20 years and 9 months. In April 2011, a new interior design for the China Center was unveiled, featuring a vertical "Folding Garden", based on a proposal by the Chinese artist Zhou Wei. On August 3, 2010, Condé Nast Publications signed a tentative agreement to move the headquarters and offices for its magazines into One World Trade Center, occupying up to 1,000,000 square feet (90,000 m2) of floor space. On May 17, 2011, Condé Nast reached a final agreement with the Port Authority, securing a 25-year lease with an estimated value of $2 billion. On May 25, 2011, Condé Nast finalized the lease contract, obtaining 1,008,012 square feet (93,647.4 m2) of office space between floors 20–41. The lease also includes 30,000 square feet (2,800 m2) of usable space in the podium and below grade floors, for mail, messenger services, and storage use. On January 17, 2012, it was reported that Condé Nast would be leasing an additional 133,000 square feet (10,000 m2) of space, occupying floors 42 through 44. Conde Nast moved in on November 3, 2014. However, some leases failed. In January 2012, Chadbourne & Parke, a Midtown Manhattan-based law firm, was to sign a 300,000 square feet (30,000 m2) lease contract, but after negotiations broke down, the deal was abruptly canceled in March. In August 2014, it was announced Servcorp signed a 15-year lease for 34,775 square feet (3,230.7 m2), taking the entire 85th floor. Servcorp subsequently sublet all of its space on the 85th floor as private offices, boardrooms and co-working space to numerous medium-sized businesses such as ThinkCode, D100 Radio, and Chérie L'Atelier des Fleurs. Larry Silverstein of Silverstein Properties, the leaseholder and developer of the complex, retains control of the surrounding buildings, while the Port Authority has full control of the tower itself. Silverstein signed a 99-year lease for the World Trade Center site in July 2001, and remains actively involved in most aspects of the site's redevelopment process. Before construction of the new tower began, Silverstein was involved in an insurance dispute regarding the tower. The terms of the lease agreement signed in 2001, for which Silverstein paid $14 million, gave Silverstein, as leaseholder, the right and obligation to rebuild the structures if they were destroyed. After the September 11 attacks, there were a series of disputes between Silverstein and insurance companies concerning the insurance policies that covered the original towers; this resulted in the construction of One World Trade Center being delayed. After a trial resulted, a verdict was given on April 29, 2004. The verdict was that ten of the insurers involved in the dispute were subject to the "one occurrence" interpretation, so their liability was limited to the face value of those policies. Three insurers were added to the second trial group. At that time, the jury was unable to reach a verdict on one insurer, Swiss Reinsurance, but it did so several days later on May 3, 2004, finding that this company was also subject to the "one occurrence" interpretation. Silverstein appealed the Swiss Reinsurance decision, but the appeal failed on October 19, 2006. The second trial resulted in a verdict on December 6, 2004. 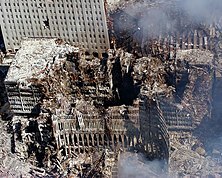 The jury determined that nine insurers were subject to the "two occurrences" interpretation, referring to the fact that two different planes had destroyed the towers during the September 11 attacks. They were therefore liable for a maximum of double the face value of those particular policies ($2.2 billion). The highest potential payout was $4.577 billion, for buildings 1, 2, 4, and 5. In March 2007, Silverstein appeared at a rally of construction workers and public officials outside an insurance industry conference. He highlighted what he describes as the failures of insurers Allianz and Royal & Sun Alliance to pay $800 million in claims related to the attacks. Insurers state that an agreement to split payments between Silverstein and the Port Authority is a cause for concern. David Childs, one of Silverstein's favorite architects, joined the project after Silverstein urged him to do so. He developed a design proposal for One World Trade Center, initially collaborating with Daniel Libeskind. In May 2005, Childs revised the design to address security concerns. He is the architect of the tower, and is responsible for overseeing its day-to-day design and development. Daniel Libeskind won the 2002 competition to develop a master plan for the World Trade Center's redevelopment. Architect Daniel Libeskind won the invitational competition to develop a plan for the new tower in 2002. He gave an initial proposal, which he called "Memory Foundations", for the design of One World Trade Center. His design included aerial gardens, windmills, and off-center spire. Libeskind later denied a request to place the tower in a more rentable location next to the PATH station. He instead placed it another block west, as it would then line up with, and resemble, the Statue of Liberty. Most of Libeskind's original designs were later scrapped, and other architects were chosen to design the other WTC buildings. [note 2] However, one element of Libeskind's initial plan was included in the final design – the tower's symbolic height of 1,776 feet (541 m). Daniel R. Tishman – along with his father John Tishman, builder of the original World Trade Center – led the construction team from Tishman Realty & Construction, the selected builder for One World Trade Center. Douglas and Jody Durst, the co-presidents of the Durst Organization, a real estate development company, won the right to invest at least $100 million in the project on July 7, 2010. In August 2010, Condé Nast, a long-time Durst tenant, confirmed a tentative deal to move into One World Trade Center, and finalized the deal on May 26, 2011. The contract negotiated between the Port Authority and the Durst Organization specifies that the Durst Organization will receive a $15 million fee, and a percentage of "base building changes that result in net economic benefit to the project". The specifics of the signed contract give Durst 75 percent of savings up to $24 million, stepping down to 50, 25, and 15 percent as savings increase. Since Durst joined the project, significant changes have been made to the building, including the 185 foot base of the tower, the spire, and the plaza to the west of the building, facing the Hudson River. The Port Authority has approved all the revisions. A WoodSearch Films short-subject documentary entitled How does it feel to work on One World Trade Center? was uploaded to YouTube on August 31, 2010. It depicted construction workers who were satisfied with the working conditions at the construction site. However, further analysis of the work site showed that dozens of construction-related injuries had occurred at the site during the construction of One World Trade Center, including 34 not reported to the U.S. Occupational Safety and Health Administration. Workers also left post-9/11-related graffiti at the site, which are supposed to symbolize rebirth and resilience. ^ During the planning stages, the building was initially dubbed as the Freedom Tower. In later years, the building's owners decided to call it One World Trade Center. ^ Foster and Partners was chosen for 2 WTC, Richard Rogers was chosen for 3 WTC, Fumihiko Maki and associates was chosen for 4 WTC, Kohn Pederson Fox was chosen for 5 WTC. ^ a b Westfeldt, Amy (March 26, 2009). "Freedom Tower has a new preferred name". Silverstein Properties. Associated Press. Archived from the original on May 31, 2009. Retrieved March 30, 2009. ^ Stanglin, Doug (May 10, 2013). "Spire permanently installed on WTC tower". USA Today. Gannett Company. Retrieved May 10, 2013. ^ a b Smith, Aaron (November 3, 2014). "One World Trade Center, the tallest building in the Western Hemisphere, is open for business". money.cnn.com. CNN Money. Retrieved March 30, 2017. ^ a b "One World Trade Center Observatory Opens to Public". usnews.com. U.S. News. Retrieved March 30, 2017. ^ a b Brennan, Morgan (April 30, 2012). "1 World Trade Center Officially New York's New Tallest Building". Forbes. Retrieved July 26, 2013. ^ a b c Brown, Eliot (January 30, 2012). "Tower Rises, And So Does Its Price Tag". The Wall Street Journal. Retrieved September 16, 2015. ^ a b c d e f g h i j k "One World Trade Center – The Skyscraper Center". Council on Tall Buildings and Urban Habitat. September 11, 2015. Retrieved September 11, 2015. ^ a b c d "One World Trade Center". Emporis.com. Retrieved January 14, 2012. ^ "One World Trade Center to retake title of NYC's tallest building". Fox News. Associated Press. April 29, 2012. Retrieved May 1, 2014. ^ "Office Leasing". One World Trade Center. Retrieved November 3, 2014. ^ "Elevating One World Trade Center". ThyssenKrupp Elevator. Retrieved January 23, 2017. ^ a b c d "One World Trade Center". WTC.com. Silverstein Properties. September 16, 2015. Retrieved September 16, 2015. ^ "The Louis Berger Group and Hill International to Provide Program Management Services for Downtown Restoration Program and WTC Transportation Hub". Hill International, Inc. August 13, 2004. Archived from the original on March 31, 2015. Retrieved July 21, 2015. ^ a b c d "One World Trade Center". SkyscraperPage. . Retrieved January 17, 2012. ^ "Freedom Tower Will Be Called One World Trade Center". foxnews.com. Fox News. March 26, 2009. Retrieved March 30, 2017. ^ Feiden, Douglas (March 27, 2009). "'Freedom' out at WTC: Port Authority says The Freedom Tower is now 1 World Trade Center". nydailynews.com. Daily News New York. Retrieved March 30, 2017. ^ Gillespie, Angus K. (1999). "Chapter 1". Twin Towers: The Life of New York City's World Trade Center. Rutgers University Press. ISBN 0-7838-9785-5. ^ "Authority Trains Winning Plaudits". The New York Times. September 4, 1967. Five years ago, the Port of New York Authority took over the bankrupt and antiquated Hudson Tubes. Yesterday the management, employees and commuters appeared reasonably pleased with the improvements made under the Port Authority Trans-Hudson Corporation. ^ National Construction Safety Team (September 2005). Final Report on the Collapse of the World Trade Center Towers (PDF). NIST. ^ Darton, Eric (1999) Divided We Stand: A Biography of New York's World Trade Center, Chapter 6, Basic Books. ^ a b Holusha, John (January 6, 2002). "Commercial Property; In Office Market, a Time of Uncertainty". The New York Times. Retrieved November 21, 2008. ^ a b "Ford recounts details of Sept. 11". Real Estate Weekly. BNET. February 27, 2002. Archived from the original on March 26, 2010. Retrieved January 3, 2009. ^ "Seven World Trade Center (pre-9/11)". Emporis.com. Retrieved May 7, 2006. ^ a b "Timeline: World Trade Center chronology". PBS – American Experience. Retrieved May 15, 2007. ^ a b Mcdowell, Edwin (April 11, 1997). "At Trade Center Deck, Views Are Lofty, as Are the Prices". The New York Times. Retrieved September 12, 2009. ^ a b "Official Opening of Iconic Burj Dubai Announced". Gulf News. November 4, 2009. Archived from the original on November 6, 2009. Retrieved November 4, 2009. ^ Yoneda, Yuka (September 11, 2011). "6 Important Facts You May Not Know About One World Trade Center". Inhabitat. Archived from the original on April 29, 2014. Retrieved April 28, 2014. ^ Deutsch, Claudia H (February 26, 1995). "Commercial Property/World Trade Center; Attuning a Huge Concourse to an Upscale Trade". The New York Times. Retrieved April 11, 2013. ^ "Air-Cooled PATH Terminal in World Trade Center Opens Tuesday". The New York Times. July 1, 1971. p. 94. Retrieved May 30, 2010. ^ "Office locations". Cantor Fitzgerald. March 4, 2000. Retrieved on October 4, 2009. ^ "World Trade Center Building Performance Study" (PDF). Federal Emergency Management Agency. Retrieved March 8, 2007. Six 1,200-kilowatt (kW) emergency power generators located in the sixth basement (B-6) level provided a secondary power supply. ^ Fischbach, Amy Florence (January 1, 2001). "Towering security". CEE News. Archived from the original on October 21, 2006. Retrieved March 8, 2007. E-J Electric set four generators on the roof of Tower 5, which was nine stories, as opposed to the 110-story Towers 1 and 2. E-J then ran high-voltage feeder cable to One, Two, Four, and Five World Trade Center, installed three substations and distributed power to the tenants. ^ a b c d "The Two Twin Towers of 2001 – What brought them Down!". Archived from the original on March 4, 2016. Retrieved April 28, 2014. ^ Bagli, Charles V. (May 12, 2003). "Broadcasters Put Antennas In Midtown". The New York Times. Retrieved April 28, 2014. ^ a b c "Trade Center Hit by 6-Floor Fire". The New York Times. February 14, 1975. Retrieved September 11, 2008. ^ Nadine M. Post (November 4, 2002). "Study Absolves Twin Tower Trusses, Fireproofing". Retrieved May 1, 2014. ^ "9/11 Commission Report". The National Commission on Terrorist Attacks Upon the United States. ^ Miller, Bill (May 1, 2002). "Skyscraper Protection Might Not Be Feasible, Federal Engineers Say". Orlando Sentinel. Retrieved November 24, 2013. ^ a b Sunder (2005), p. 48. ^ Westfeldt, Amy (March 23, 2007). "Debate over staircase slows WTC project". Times Union. Associated Press. Archived from the original on May 6, 2014. Retrieved May 4, 2014. ^ "Lower Manhattan Development Corporation Announces Design Study for World Trade Center Site and Surrounding Areas" (Press release). RenewNYC.org. August 14, 2002. Retrieved August 7, 2008. ^ Walsh, Edward (September 15, 2001). "Bush Encourages N.Y. Rescuers" (PDF). The Washington Post. pp. A10. Archived from the original (PDF) on July 24, 2011. Retrieved July 31, 2010. ^ "Address to a Joint Session of Congress and the American People". The White House. September 20, 2001. Archived from the original on February 25, 2008. ^ "Freedom Tower's Evolution". The New York Times. January 3, 2006. Retrieved January 14, 2012. ^ "America's Freedom Tower?". MSNBC. February 17, 2005. Retrieved November 22, 2011. ^ a b c d "Prismatic glass façade for WTC tower scrapped" Archived March 3, 2016, at the Wayback Machine. The Huffington Post. May 12, 2011. Retrieved June 19, 2011. ^ "Final design for Freedom Tower is unveiled". Civil + Structural Engineer. Archived from the original on April 29, 2014. Retrieved April 28, 2014. ^ "Trucks roll to begin Freedom Tower construction". Daily News. New York. April 27, 2006. Archived from the original on May 3, 2006. ^ a b Cooper, Michael (March 16, 2006). "Stalled Talks Are More Bad News for Pataki". The New York Times. Retrieved July 24, 2013. ^ "Governor Pataki, Governor Mcgreevey, Mayor Bloomberg Lay Cornerstone for Freedom Tower". PANYNJ.gov (Press release). Port Authority of New York and New Jersey. July 4, 2004. Retrieved September 27, 2018. ^ "Cornerstone of Freedom Tower removed". CBS News. June 25, 2006. Archived from the original on January 8, 2007. ^ "One World Trade Center". FRASER: Building His District, Brick by Brick. Retrieved May 1, 2014. ^ "Building of N.Y. Freedom Tower begins". USA Today. Associated Press. April 28, 2006. Retrieved February 1, 2009. ^ Chan, Sewell (December 18, 2006). "Messages of Love and Hope on a Freedom Tower Beam". The New York Times. Retrieved July 17, 2013. ^ "First Freedom Tower Beam Rises At Ground Zero". WCBS-TV. December 19, 2006. Archived from the original on December 20, 2006. Retrieved July 17, 2013. ^ a b "Statement by Port Authority Regarding Preparation of Towers 3 and 4 Bathtub at WTC Site to Allow Silverstein Properties to Begin Construction in January" (Press release). Port Authority of New York & New Jersey. December 31, 2007. Archived from the original on September 16, 2009. Retrieved July 17, 2013. ^ "World Trade Center project has begun to take shape". The Star-Ledger. May 6, 2010. Archived from the original on June 29, 2012. Retrieved September 27, 2018. ^ Strunsky, Steve (May 18, 2010). "Port Authority installs cocoon safety system around World Trade Center steel structure". The Star-Ledger. Archived from the original on June 29, 2012. Retrieved September 27, 2018. ^ "1 WTC, aka Freedom Tower, reaches halfway mark". The Wall Street Journal. Associated Press. December 16, 2010. Archived from the original on December 21, 2010. ^ "World Trade Center Growing This Summer". PANYNJ.gov. Port Authority of New York and New Jersey. 2011. Retrieved June 1, 2011. ^ "The World Trade Centre Slow building". The Economist. April 23, 2009. Archived from the original on May 31, 2009. Retrieved May 31, 2009. ^ "'Freedom' out at WTC: Port Authority says The Freedom Tower is now 1 World Trade Center". Daily News. New York. March 27, 2009. Retrieved March 26, 2014. ^ Weiss, Lois; Bennett, Chuck (October 24, 2012). "Detailed schematics of 1 World Trade Center posted online". New York Post. Archived from the original on October 24, 2012. Retrieved September 27, 2018. ^ a b c d e f g "One World Trade Center". PANYNJ.gov. Port Authority of New York and New Jersey. Retrieved September 27, 2018. ^ ""Tribute in Lights" illuminated in NYC skyline at night". Xinhua News Agency. September 11, 2011. Archived from the original on November 26, 2013. Retrieved April 27, 2013. ^ "One World Trade Center: Construction Progress". The Atlantic. September 10, 2012. Retrieved April 28, 2014. ^ "One World Trade Center's spire is illuminated for the first time but New York faces a tense wait to see if it qualifies as the tallest tower in the US (with stiff competition from Chicago)". Daily Mail. Associated Press. November 9, 2013. Retrieved April 28, 2014. ^ "World Trade Center design flaw could cost millions". The Wall Street Journal. Associated Press. February 1, 2012. Archived from the original on March 15, 2012. Retrieved February 1, 2012. ^ a b "One World Trade Center construction updates". Lower Manhattan.info. February 14, 2014. Archived from the original on December 19, 2013. Retrieved February 24, 2014. ^ a b Brown, Eliot (March 30, 2012). "One World Trade Center Hits 100 Stories, Helped by Funny Math". The Wall Street Journal. Retrieved April 1, 2012. ^ "It's official: 1 WTC is New York's new tallest building". Daily News. New York. April 30, 2012. Retrieved April 30, 2012. ^ "One World Trade Center On Top As Tallest Building In New York City". International Business Times. April 30, 2012. Archived from the original on June 26, 2012. Retrieved September 27, 2018. ^ Poppy Harlow; George Lerner; Jason Hanna (June 15, 2012). "Obama signs beam of One World Trade Center". CNN. Retrieved August 2, 2012. ^ Brown, Eliot (April 11, 2012). "With New Logo, 1 WTC Begins Marketing Push". The Wall Street Journal. Archived from the original on January 15, 2016. Retrieved September 27, 2018. ^ Higgs, Larry (August 30, 2012). "One World Trade Center steel skeleton completed". Asbury Park Press. Retrieved August 30, 2012. ^ a b "Steel spire rises atop New York's One World Trade Center". Reuters. December 12, 2012. Retrieved October 27, 2017. ^ Mathias, Christopher (December 12, 2012). "One World Trade Center Spire: Workers Begin To Hoist Spire Atop City's Tallest Building (PHOTOS) (VIDEO)". The Huffington Post. Retrieved December 13, 2012. ^ "FIRST SECTION OF SPIRE INSTALLED AT ONE WORLD TRADE CENTER". PANYNJ. January 15, 2013. Retrieved February 12, 2013. ^ "1 World Trade Center to top out Monday as tallest building in hemisphere". CNN. April 28, 2013. Retrieved April 28, 2013. ^ "Final pieces hoisted atop One World Trade Center". CNN. May 3, 2013. Retrieved May 3, 2013. ^ Edmiston, Jake (May 2, 2013). "'A historic milestone': 125-metre spire from Quebec crowns World Trade Centre in N.Y.C after dispute solved". National Post. Retrieved October 27, 2017. ^ Simone Foxman (September 13, 2013). "The puzzling non-profit behind the "World Trade Center" name makes a surprising amount of money". Quartz. Retrieved September 14, 2013. ^ "Tallest building ruling: Willis Tower loses to One World Trade Center". Chicago Tribune. November 12, 2013. Retrieved November 12, 2013. ^ a b "Architects rule 1 World Trade Center tallest building in US". MyFoxNY. Archived from the original on November 11, 2013. Retrieved November 12, 2013. ^ "CTBUH Affirms One World Trade Center Height". Council on Tall Buildings and Urban Habitat. November 12, 2013. Retrieved November 12, 2013. ^ DeGregory, Priscilla (November 3, 2014). "1 World Trade Center is open for business". New York Post. Retrieved November 18, 2014. ^ a b c Bagli, Charles V. (November 2, 2014). "Condé Nast Moves Into the World Trade Center as Lower Manhattan Is Remade". The New York Times. Retrieved November 13, 2014. ^ a b Dawsey, Josh (October 23, 2014). "One World Trade to Open Nov. 3, But Ceremony is TBD". The Wall Street Journal. Retrieved October 23, 2014. ^ a b c Margolin, Josh (November 3, 2014). "1 World Trade Center Opening Highlights Rebirth, Renewal Following 9/11 Attacks". ABC News. Archived from the original on August 25, 2016. Retrieved September 26, 2018. ^ "One World Trade Center to become NYC's tallest building". WJLA-TV. Associated Press. April 30, 2012. Retrieved September 16, 2015. ^ a b Morris, Keiko (November 2, 2014). "Finally, Tenants at One World Trade Center". The Wall Street Journal. Retrieved November 13, 2014. ^ "World Trade Center opens for business". USA Today. Associated Press. November 3, 2014. Retrieved November 13, 2014. ^ "They train for this: Crews rescue World Trade Center window washers". CNN. November 12, 2014. Retrieved November 13, 2014. ^ "2 workers rescued from 69th-floor scaffold at One WTC". USA Today. November 12, 2014. Retrieved November 13, 2014. ^ Santoro, Marc (November 12, 2014). "Peril, and Daring, at 1 World Trade Center as Window Washers Are Trapped". New York Times. Retrieved November 12, 2014. ^ a b Nordenson, Guy (February 16, 2007). "Freedom From Fear". The New York Times. Retrieved February 2, 2012. ^ Bagli, Charles V. (February 13, 2007). "Spitzer, in Reversal, Is Expected to Approve Freedom Tower, Officials Say". The New York Times. Retrieved May 2, 2012. ^ a b c d e f g h i j k l m David W. Dunlap (June 12, 2012). "1 World Trade Center Is a Growing Presence, and a Changed One". The New York Times. Retrieved December 9, 2012. ^ a b c Transportation Nation: "Patrick Foye Named New Executive Director of NY-NJ Port Authority" By Jim O'Grady Archived April 15, 2013, at the Wayback Machine. October 19, 2012. ^ a b c d e f Eliot Brown (May 10, 2012). "Pointed Spat Over World Trade Spire". The Wall Street Journal. Retrieved December 9, 2012. ^ a b c Steve Cuozzo (May 24, 2012). "World Trade Center offers warm welcome". New York Post. Retrieved December 9, 2012. ^ a b "Refined Master Site Plan for the World Trade Center Site". Lower Manhattan Development Corporation. Retrieved May 1, 2014. ^ Frangos, Alex (July 7, 2004). "New Dimensions in Design". Wall Street Journal. ISSN 0099-9660. Retrieved March 23, 2018. ^ "New York beefs up World Trade Center site security for September 11 10th anniversary" Archived April 15, 2016, at the Wayback Machine. The Telegraph. August 8, 2011. Retrieved February 12, 2013. ^ "New glass design for One World Trade Center base wins approval" Archived February 28, 2015, at the Wayback Machine. WTC.com, November 15, 2011. Retrieved November 18, 2011. ^ "Curtain Wall Installation Begins at One World Trade Center" (Press release). [[Skidmore, Owings and Merrill | Skidmore, Owings & Merrill LLP]]. November 16, 2010. Archived from the original on December 14, 2010. Retrieved December 23, 2016. ^ "The Freedom Tower: World Trade Center, New York". Glass Steel and Stone. Archived from the original on February 9, 2010. Retrieved March 13, 2010. ^ a b c d "SOM Freedom Tower Fact Sheet" (PDF) (Press release). Lower Manhattan Development Corporation. June 2005. ^ "Design Overview". 9/11 Memorial. Retrieved November 3, 2014. ^ Handwerker, Haim (November 20, 2007). "The politics of remembering Ground Zero – Haaretz – Israel News". Haaretz. ^ Herzenberg, Michael (September 7, 2011). "Mayor, WTC Developer Say Trade Center Site Has New Lease On Life". NY1. Archived from the original on September 21, 2011. Retrieved September 8, 2011. ^ "World Trade Centre Behind Schedule And Over Budget Says New York Governor". Sky News. Archived from the original on May 14, 2011. Retrieved March 13, 2010. ^ Barrionuevo, Alexei (July 26, 2005). "In Chicago, Plans for a High-Rise Raise Interest and Post-9/11 Security Concerns". The New York Times. Retrieved March 13, 2013. ^ "Art fit for a skyscraper". The Economist. New York. November 6, 2014. Retrieved January 27, 2018. ^ Munro, Cait (November 21, 2014). "Is José Parlá's Mural at One World Trade Center the World's Largest Welcome Mat?". Artnet News. Retrieved January 27, 2018. 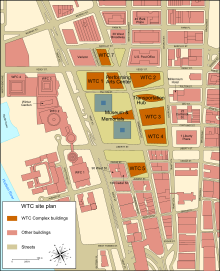 ^ "The World Trade Center Retail Floor Plans (Part 2)". Tribeca Citizen. January 16, 2014. Retrieved January 16, 2014. ^ a b "Observatory at 1 World Trade Center opens to public May 29". Crain's New York. Associated Press. April 8, 2015. Retrieved April 9, 2015. ^ Chung, Jen (October 28, 2014). "One World Trade Center Observatory Sets Admission At $32". gothamist. Archived from the original on October 31, 2014. Retrieved October 28, 2014. ^ "One World Observatory". Port Authority of New York and New Jersey. Archived from the original on May 22, 2014. Retrieved May 22, 2014. ^ Gelfand, Eric (February 25, 2014). "ONE WORLD OBSERVATORY LAUNCHES". Legends.net. Retrieved May 22, 2014. ^ "One WTC observation deck tickets go on sale, will open in May". NY Business Journal. April 8, 2015. Retrieved April 9, 2015. ^ Philip Messing (April 9, 2015). "Manhattan DA probing One WTC observation deck bid". NY Post. Retrieved April 9, 2015. ^ "New World Trade Centre observatory opens, banishing memories of the Twin Towers". The Telegraph. May 28, 2015. Retrieved May 28, 2015. ^ "Observatory At One World Trade Center Opens To Public Friday". CBS Local. May 28, 2015. Retrieved May 28, 2015. ^ Corky Siemaszko (April 7, 2015). 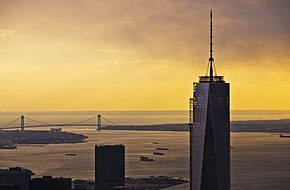 "Observation deck at World Trade Center's Freedom Tower to open May 29". NY Daily News. Retrieved April 8, 2015. ^ "WTF 1 WTC! It's $32 just to walk into your restaurant?". New York Post. April 15, 2015. ^ Alberts, Hana R. (July 1, 2015). "Don't Eat at One World Trade Center's Sky-High Restaurants". Curbed NY. Retrieved August 24, 2015. ^ a b c "One World Trade Center – Fact Sheet" (PDF). Archived from the original (PDF) on December 22, 2014. Retrieved May 5, 2014. ^ Blaszczak, Karl (September 19, 2013). "The Technology Behind One World Trade Center". Scribol. Retrieved April 28, 2014. ^ Panero, James (September 10, 2013). "A Beacon Diminished". Wall Street Journal. ^ Cuozzo, Steve (May 25, 2012). "One World Trade Center Offers Warm Welcome". New York Post. Retrieved April 25, 2014. ^ Dunlap, David W.; Collins, Glenn (June 30, 2005). "Redesign Puts Freedom Tower on a Fortified Base". The New York Times. Retrieved January 18, 2009. ^ "World Trade Center Towers – The Plan for Lower Manhattan". Lower Manhattan Development Corporation. September 11, 2015. Retrieved September 11, 2015. ^ "Makkah Royal Clock Tower Hotel — The Skyscraper Center". Council on Tall Buildings and Urban Habitat. Archived from the original on March 28, 2014. ^ "Tall towers: Signs in the sky". The Economist. January 15, 2014. Retrieved February 9, 2014. ^ Strapagiel, Lauren (May 10, 2013). "One World Trade Center not taller than CN Tower". Canada.com. Retrieved April 30, 2014. ^ Barrett, Joe (December 9, 2009). "Push to Finish Tallest Tower". The Wall Street Journal. Retrieved April 24, 2013. ^ a b c "Change Means One World Trade Center Might Not Be America's Tallest Building". CBS New York. May 10, 2012. Retrieved August 17, 2012. ^ a b "Questions on One World Trade Center Height". CTBUH. May 10, 2012. Retrieved July 24, 2013. ^ Brown, Eliot (May 10, 2012). "Pointed Spat Over World Trade Spire". The Wall Street Journal. Retrieved August 17, 2012. ^ "Dispute over antenna could cost One World Trade Center title of tallest building in US". FOX News Network. May 9, 2012. Retrieved August 17, 2012. ^ "432 Park Avenue". SkyscraperPage.com. Retrieved August 17, 2012. ^ Ewing, Michael (March 30, 2012). "432 Park Avenue Will Reach 1,397 Feet, Taller Even Than the World Trade Center". The New York Observer. Retrieved August 17, 2012. ^ "One World Trade Center's Skinny Spire Redesign Might Not Measure Up". Architectural Record. The McGraw-Hill Companies, Inc. August 15, 2012. Retrieved August 17, 2012. ^ "Rising new One World Trade Centre to push the envelope in green building design". Green Prospects Asia. February 27, 2012. Archived from the original on July 24, 2013. Retrieved July 24, 2013. ^ "Fuel cells: a clean energy alternative at new World Trade Center". CleanTechnica.com. December 18, 2011. Retrieved January 24, 2012. ^ Troianovski, Anton (November 1, 2010). "WTC taps fuel cells". The Wall Street Journal. Retrieved January 24, 2012. ^ a b Dunlap, David W. (July 9, 2008). "Answers About Ground Zero Rebuilding". The New York Times. Retrieved July 9, 2008. ^ a b c "One World Trade Center: A New Icon for New York City". The Port Authority of New York & New Jersey. Archived from the original on December 27, 2010. Retrieved January 27, 2011. ^ Tarantola, Andrew (September 9, 2011). "How to Terror-Proof the New World Trade Center". Gizmodo. Retrieved May 22, 2014. ^ a b Dunlap, David W. (May 15, 2014). "Passes Are No Longer Needed at 9/11 Memorial". The New York Times. Retrieved May 22, 2014. ^ "Visitor Rules and Regulations". Articles of Incorporation. World Trade Center Memorial Foundation, Inc. Retrieved May 29, 2012. ^ "Visitor Rules and Regulations". Web. 911memorial.org. Retrieved April 28, 2014. The "Interim Operating Period" is the period during which the Memorial Plaza (defined below) is surrounded by World Trade Center construction on all four sides and accessible by visitors only via the 9/11 Memorial Welcome Site. The approximate duration of the Interim Operating Period is from September 11, 2011 to December 31, 2013. ^ Feeney, Sheila A. (May 21, 2014). "9/11 Memorial Museum opens to the public". AM New York. Retrieved May 21, 2014. ^ "New Jersey teen sneaks to top of 1 World Trade Center, police say". CNN. March 20, 2014. Retrieved March 26, 2014. ^ Peyser, Andrea (April 4, 2014). "Trespassers at 1 WTC are a wakeup call". New York Post. Retrieved April 24, 2014. ^ Stepansky, Joseph & Thomas Tracy (March 20, 2014). "Daredevil teen sneaked into 1 World Trade Center". Daily News. New York. Retrieved April 24, 2014. ^ Margolin, Josh & Alyssa Newcomb (March 20, 2014). "Teen Sneaks Past Security, Climbs Atop 1 World Trade Center". ABC News. Retrieved April 24, 2014. ^ "Teen's Stunt Exposes That WTC Has No Working Surveillance Cameras". Mashable. March 20, 2014. Retrieved April 24, 2014. ^ "Teen who climbed World Trade Center sentenced". CBS News. September 3, 2014. Retrieved April 8, 2018. ^ "Four men arrested in One World Trade Center jump stunt". CNN. March 25, 2014. Retrieved March 26, 2014. ^ Sanburn, John (March 25, 2014). "Meet the Man Who Jumped Off One World Trade Center". Time. Retrieved April 24, 2014. ^ Rawlings, Nate (March 25, 2014). "WATCH: BASE Jumpers Leap Off One World Trade Center". Magazine. Retrieved April 24, 2014. ^ "World Trade Center Security Boss Quits Over Breach". NBC News. March 29, 2014. Retrieved April 2, 2014. ^ Greg Morabito (September 11, 2013). "Windows on the World, New York's Sky-High Restaurant — Flashbacks — Eater NY". Ny.eater.com. Retrieved April 29, 2014. ^ "PHOTOS: The Stunning Views Atop One World Trade Center". The Huffington Post. April 2, 2013. ^ Fussman, Cal (November 22, 2013). "Windows on the World September 11 – A 9/11 Story About Wine and Wisdom". Esquire. Retrieved April 29, 2014. ^ Kramer, Louise (September 17, 2001). "Owner vows to reopen Windows On The World". Crain's New York. Retrieved April 24, 2014. ^ Saxena, Jaya (March 8, 2011). "WTC Scraps Windows on the World Plan". Gothamist. Archived from the original on March 13, 2013. ^ Murdock, Deroy (March 11, 2005). "What Are We Afraid Of?". National Review. Archived from the original on March 11, 2005. Retrieved November 8, 2012. ^ "Letters to the editor: Taking the Measure of the New Freedom Tower". The New York Times. July 1, 2005. Retrieved November 8, 2012. ^ Ouroussoff, Nicolai (March 4, 2007). "Medieval Modern: Design Strikes a Defensive Posture". The New York Times. Retrieved May 20, 2010. ^ David M. Levitt (July 8, 2010). "Durst, Onetime Critic, Wins Bid for Stake in 1 WTC". Bloomberg BusinessWeek. Archived from the original on August 13, 2011. Retrieved July 17, 2013. ^ Joe Nocera (September 17, 2010). "In Skyscraper at Ground Zero, Sentiment Trumped Numbers". The New York Times. ^ a b Smith, Aaron (September 11, 2012). "World Trade Center returns to New York skyline". CNN. Retrieved January 4, 2013. ^ a b "Gov. Pataki, Governor Corzine, Mayor Bloomberg Announce Agreements to Occupy Freedom Tower". US States News. September 17, 2006. ^ "A GSA haircut at 1 WTC" Archived January 21, 2012, at the Wayback Machine. New York Post. July 18, 2011. Retrieved December 6, 2011. ^ Feiden, Douglas (April 10, 2008). "Freedom Tower to open observation deck on 102nd floor". Daily News. Retrieved July 20, 2013. ^ Geiger, Daniel (May 12, 2013). "World Trade Center site sits empty as rivals lease up". Crain's New York Business. Retrieved July 20, 2013. ^ "Owners drop Freedom Tower name for new WTC skyscraper". CNN. March 28, 2009. Retrieved May 20, 2010. ^ "China Center Unveils Folding Garden Design For Its Space In 1 WTC" Archived December 23, 2011, at the Wayback Machine. ChinaCenter.com. April 14, 2011. Retrieved January 2, 2012. ^ Bagli, Charles V. (August 3, 2010). "Condé Nast to Move to Skyscraper at Ground Zero". The New York Times. Retrieved August 3, 2010. ^ Bagli, Charles V. (May 17, 2011). "Condé Nast Will Be Anchor of 1 World Trade Center". The New York Times. Retrieved May 17, 2011. ^ Cuozzo, Steve (January 17, 2012). "Condé Nast taking more space at One World Trade Center". New York Post. Retrieved June 23, 2012. ^ "Trade Tower Is Set to Add Prime Tenant, a Law Firm" Archived November 4, 2014, at the Wayback Machine. The New York Times. January 26, 2012. Retrieved January 29, 2012. ^ "Chadbourne & Parke Will Not Lease at One World Trade" Archived November 5, 2014, at the Wayback Machine. The Real Deal. March 20, 2012. Retrieved March 22, 2012. ^ Weiss, Lois (August 25, 2014). "Servcorp books a floor at 1 WTC". New York Post. ^ Schram, Lauren (August 26, 2014). "Servcorp Takes 35K SF at 1 WTC". Commercial Observer. ^ Clarke, Katherine (February 26, 2015). "SNEAK PEEK: You can have an office at One World Trade Center for $750 a month". NY Daily News. ^ "Verdict in 9/11 insurance battle". CNN. April 30, 2004. Archived from the original on May 1, 2011. ^ Frankel, Alison (September 3, 2002). "Double Indemnity: Was the WTC disaster one incident or two?". The American Lawyer. Archived from the original on September 17, 2002. ^ Goldberger, Paul (May 20, 2002). "Groundwork: How the future of Ground Zero is being resolved". The New Yorker. Archived from the original on September 17, 2004. ^ Hamblett, Mark (April 30, 2004). "Jurors Deal World Trade Center Leaseholder Major Setback". New York Law Journal. Law.com. ^ Starkman, Dean (April 30, 2004). "Jury's Decision Leaves Rebuilding of World Trade Center in Turmoil". The Wall Street Journal. p. A1. ^ Parekh, Rupal (October 18, 2006). "Appeals court rules for Swiss Re in WTC dispute". Business Insurance. ^ Hamblett, Mark (October 19, 2006). "Circuit Resolves Distribution Of 9/11 Insurance Proceeds". New York Law Journal. ^ Starkman, Dean (December 7, 2004). "Jury Rules for Silverstein on Trade Center Insurance". The Wall Street Journal. p. A11. ^ Murray, Barbra (March 2007). "WTC Developer to Get Additional $12.5M Payment from Insurer TIG". Commercial Property News. Archived from the original on November 9, 2007. ^ "Silverstein Lashes Out Against WTC Insurers". The New York Sun. March 13, 2007. ^ Profile of David Childs Archived April 15, 2016, at the Wayback Machine. America Rebuilds. 2006. Retrieved January 15, 2012. ^ Architecture – Daniel Libeskind, Master Planner for the New York World Trade Center Archived July 7, 2011, at the Wayback Machine. About.com. Retrieved January 15, 2012. ^ "What Ever Happened to Daniel Libeskind's Original WTC Freedom Tower Design?" Archived December 24, 2016, at the Wayback Machine Inhabitat.com. September 7, 2011. Retrieved April 11, 2012. ^ Marino, Vivian (January 29, 2010). "Daniel R. Tishman". The New York Times. Retrieved October 14, 2011. ^ "WTC builder on the project's status". The Real Deal. February 1, 2010. Retrieved October 14, 2011. ^ Bagli, Charles V. (August 5, 2010). "Dursts Make Deal for Stake in 1 World Trade Center". The New York Times. Retrieved July 17, 2013. ^ Bagli, Charles V. (July 7, 2010). "Dursts' Stake in World Trade Tower Helps Project". The New York Times. Retrieved July 17, 2013. ^ "Conde Nast May Move to New World Trade Center Site". WNYC News. WNYC. August 3, 2010. Archived from the original (XHTML 1.0 Transitional/CSS3) on August 21, 2010. Retrieved October 14, 2011. ^ Brown, Eliot (May 26, 2011). "A Day of Deals at One World Trade Center". The Wall Street Journal. ^ "How does it feel to work on One World Trade Center?". WoodSearch Films. August 31, 2010. Retrieved January 13, 2011. ^ Greg B. Smith (November 3, 2014). "Dozens of injuries at World Trade Center construction site went unreported". NY Daily News. Retrieved April 6, 2015. ^ Verena Dobnik (January 24, 2013). "WTC Graffiti: Workers, Visitors Leave Messages Of Hope, Defiance". Huffington Post. Associated Press. Archived from the original on April 12, 2015. Retrieved April 6, 2015.